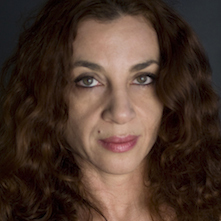 She is an award winning poet, editor and a major translator of Hispanic literature. Author of five poetry books and one children's book, and editor of three poetry anthologies. She has resided in Buenos Aires, Bogotá and New York. Currently lives in Tel Aviv. Her poems have been translated to more than 20 languages, and appeared in numerous magazines and anthologies. Eight collections of her work were published in Lithuanian (2009), in Italian (2010, 2013), in French (2011, 2011), in Spanish (2012, 2013) and in Portuguese (2013). Nitzán has edited the ground-breaking anthology With an Iron pen: Hebrew Protest Poetry 1984-2004 (2005), (English version published by SUNY Press, USA, 2009; French version by Al-Manar, 2013. She is the editor of the collection ‘Latino’, for translations from the Hispanic literature, the collection ‘Local’, for contemporary Hebrew prose, and the literary review ‘Lights’, for new writing after the masters. She often participates in national and international poetry festivals, and cooperates with musicians in poetry performance.